Drinking alcohol in Korea is more than just getting drunk. In Korea, getting drunk is essential when socializing because it takes away all the inhibition and the pretences. Koreans believe that when you go for a drink with a friend, it can get awkward at first especially if you haven’t seen that friend for a long time. If you drink together, after a while, the past relationship you enjoyed will be restored. – Lubricates tarnished relationships. As mentioned earlier, alcohol can restore past relationships. Alcohol will serve as the medium for lubricating dull or stained relationships. Enjoying a drink with a friend or a co-worker will surely restore and strengthen the relationship. – Soften icy relationships. If you feel that your relationship is getting icy and cold, you can implore the help of alcohol to make it warm. Notice that with alcohol, you seem to forget about unimportant arguments and insignificant bout. You simply enjoy so you talk about good times. If you visit Korea, do not miss their Somaek. Enjoying Somaek with locals or Korean friends can ease the relationship. Of course, too much of something is not good. 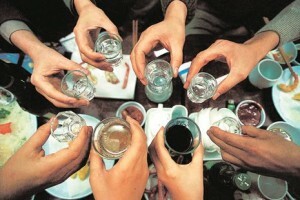 Koreans drink only once or twice a week for socialization. Well, there are those that drink every day.